Cheryl: Falling in love is something I’d never imagined. I didn’t think love existed, mainly because of the way I was raised. Relationships were never in the cards, especially since I gave a chance on one, and it nearly destroyed me. When I met Marcus Walker, I was only looking for a fling, nothing more; but the more time I spent with him, the more I realized he could be so much more. Not only has he helped me through my family drama but also with a situation I thought was way behind me. Now, I understand what love is and how powerful it can be. But will I let myself be loved, or will I continue to believe that love is not for me? Marcus: One thing I said I will never do in my life is fall in love. Being in love is great for some people, but not for me. That all changed when I met Cheryl Thompson. At first, I thought she would be like the rest, just a one-night stand, but when I saw what she was going through, I realized she was much more than a fling; she was someone I wanted to commit to. Will I be able to trust myself and give her what she needs, or will I end up destroying her even more? 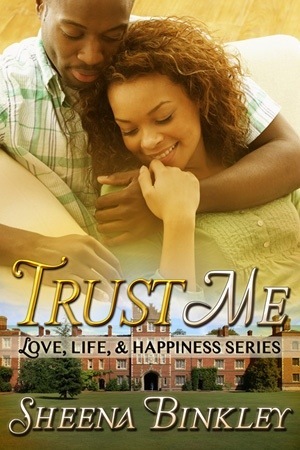 Sheena Binkley brings a unique spin to the African-American Romance and New Adult genres with Trust Me, the second book from the Love, Life, & Happiness series. This book is available in e-book and print on Amazon and other major retailers. 1. What was unique about the setting of the book and how did it enhance or take away from the story? The setting for Trust Me was built around a college town and gave an excellent backdrop to college life and what people have experienced in a given semester. It provided a visual for readers to go on a journey with the characters and the experiences they’d shared throughout the story. 2. What specific themes did you emphasize throughout the novel? What were you trying to get across to the reader? I think readers will take away the fact that it’s okay to trust your significant other by being understanding and having each other’s back throughout any situation. Although relationships can be rough and can cause problems, by being in love, it can help majority of your situations become happy and joyous. 3. Do the characters seem real and believable? Can you relate to their predicaments? To what extent do they remind you of yourself or someone you know? Each character in the story has a unique quality to them that makes them relatable to readers. Personally, the characters are based from some of the people that I have come across in my life; therefore, I try to have some sort of realness to each character in the story. 4. How do characters change or evolve throughout the course of the story? What events trigger such changes? For the main characters, they both go through life changes that make them re-evaluate what’s important to them and the people around them. While one person becomes stronger from the issues she has to relive through, one realizes that life can be wonderful with the right person by his side. By the end of the story, the two realize love can be wonderful and they shouldn’t hide from it, and I think that’s the main focus throughout the entire story. 5. In what ways do the events in the books reveal evidence of the your world view? I think everyone will go through their own struggles in life; whether it’s with a loved one, a job, or even a friendship, people will have to think about what they have experienced and whether it will help them become a strong person. With everyone in the story, I think they had to go through their own set of issues or struggles to realize that life is a learning process and they should be able to learn from their mistakes to become a better person. 6. Was there a basis for your story? A previous experience? Something else? The story was not based from a real-life issue or experience, but I think readers can relate to the story and the characters and realize that could had actually happen to them, and read through the journey that both of the characters had to endure in order to be happy. 7. What is your method for writing a book? A certain amount of hours every day? A certain routine? Are you character/story builder or an outliner or some other method? My routine for writing a story is whatever mood I’m in. Some days, I could be all day in front of the computer, typing away without a care in the world; while others, I do not even want to write (which is not often for me). It’s just the mood I’m in and what type of thoughts I have in mind to prepare myself to write. 8. How do you get past writers block or distractions like the internet? I try to set some time for writing and time for other things that I have to do throughout the day; for example, I do not try to write past two or three hours. Taking a break can help me stay relaxed and not be drained from thoughts or information. If I do have writer’s block, I would simply stop and do something else; for example, read a book, watch TV, or listen to music. 9. Favorite book from childhood. I loved reading Sweet Valley High and The Baby-Sitters’ Club. Those were the books that motivated me to become a writer, so I owe a lot to those books. 10. What’s on your desk? Can you see your desk? Describe what you see when you look around. I don’t have a desk, but I do have an area that I would keep my laptop and my writing materials. Currently, I’m brainstorming ideas for a new book; therefore, the area is a little scattered, but that is the best way for me to think and to stay focus with my ideas.